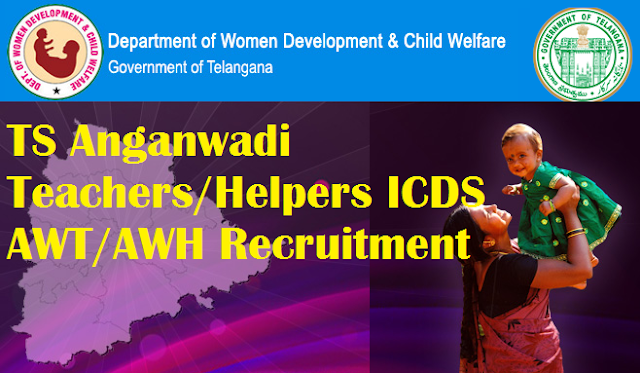 Telangana is one of the few states where a separate Department is functioning for development and welfare of women and children. In many states, these come under the Social Welfare Department. The broad mandate of the Department is to have holistic development of Women and Children. For the holistic development of the child, the Department has been implementing the world's largest and most unique and outreach programme of Integrated Child Development Services (ICDS) providing a package of services comprising supplementary nutrition, immunization, health check up and referral services, pre-school non-formal education. There are 35,700 Anganwadi Centers functioning in the State in 149 ICDS Projects. I Step: The Candidate has to visit the WEBSITE http://wdcw.tg.nic.in and fill the application. While filling the same, the candidates have to ensure that there are no mistakes in it. The Department bears no responsibility for the mistakes, if any, made by the candidates. II Step: By Clicking Preview button, the Candidate has to verify the details displayed on the screen. If any details are to be changed, candidate should go back to the previous page and Edit the details. The Candidate has to select Checkbox to accept that the details filled by the candidate are true as per their knowledge, before submitting the application. III Step: Immediately after submitting the application, the applicant will get an acknowledgement form. The applicant can download the acknowledgement form by clicking the Download button. No relevant column of the application form should be left blank; otherwise application form will not be accepted. The Department is not responsible, for any discrepancy in details of candidates while submitting the application form through Online. The applicants are therefore, advised to check the details before submitting the application. The particulars furnished by the applicant in the Application Form will be taken as final, and data entry is processed, based on these particulars only by Computer. Candidates should, therefore, be very careful in Uploading / Submitting the Application Form Online. Incorrect application form will be summarily rejected. The information if any furnished by the candidate subsequently in any form will not be entertained by the Commission under any circumstances. Applicants should be careful in filling-up the application form and submission. If any lapse is detected during the scrutiny, the candidature will be rejected even though he/she comes through the final stage of recruitment process or even at a later stage. Before Uploading/Submission of Application Form, the Candidates should carefully ensure his/her eligibility for this recruitment.